Centella asiatica (which relate closely to 'madecassoside' and 'cica') has been a big beauty buzzword for a while now in the beauty community. It's listed as a notable ingredient in countless skincare products, for example, the ever famous Dr, Jart+ Cicapair range, Centella Blemish Cream and Ampoule from Cosrx, Etude House Soon Jung skincare line, Innisfree Bija Cica Baim, the newest L'Oreal Revitalift range, Cicaplast Baume from La Roche and also, this ingredient is inside the moisturiser that I'll be reviewing today, A'Pieu Madecassoside Cream. Click more after the jump break. WHAT EXACTLY IS Centella asiatica? and cica? (especially this) because it seems to be the most popular word used in naming products. While a lot of people associating 'cica' as a short form of the word Centella asiatica, a Reddit user from r/SkincareAddiction noted that 'cica' is originated from the word 'cicatrisation' (sĭk′ə-trīz′) and if you do a quick search, it's actually a medical term that brings the meaning of "to heal" or "the repair of scar tissue". I thought that would make sense because Centella asiatica products are known to have such healing and repairing properties to skin barrier. Now, Centella asiatica (other names; Gotu Kola, Indian Pennywort, Tiger Grass) is a herb and edible plant, commonly found and employed in many cultures in Asia. It's a part of the traditional Ayurvedic medicine. In Malay, we called it as 'pokok daun pegaga', namely one of the famous varieties of ulam/salad. I used to eat this with rice and sambal belacan when I was growing up as it was easily available unlike these days, it's pretty much hard to find, at least at the wet market nearby my house. Meanwhile, madecassoside is one of the four main active terpenoids in Centella asiatica studied for their skincare benefits. For further reading, head over to Lab Muffin's blog where she discussed more on the plant, its benefits supported by several journals. Or else, you can read these published journals, Centella asiatica in Dermatology: An Overview, and Burn Wound Healing Properties of Asiaticoside and Madecassoside, whereby madecassoside is mainly documented as a wound healer. Besides that, there are also several studies showed how this active ingredient is able to stimulate the collagen production and a prolonged effect of topical treatment containing madecassoside has shown fairly large improvement on ageing skin in term of suppleness, firmness, wrinkles and roughness, as well as skin hydration [here]. Basically, Centella asiatica IS a good skincare ingredient. This moisturiser was my first encounter with skincare containing Centella asiatica extract as the highlighted ingredient. I've been testing it since last year and now it's finished and ready to be thrown into the bin. Honestly, I don't have enough good photos of this product at first, so I don't really see myself blogging about it earlier but on a second thought, let me just sit here and start working on the review before I become completely forgot about the overall experience I have with this product. I bought the A'Pieu cream last year in June through one of my AB friend, Karyn. She organized a group haul for Koreadepart before the shipping rate increased. These days, however, you can get A'Pieu Madecassoside Cream almost everywhere and the easiest one is to buy directly from A'Pieu official store in Malaysia (https://apieumalaysia.com/). They have several physical stores in Johor and the one in KL located on the 3rd floor, Mid Valley Megamall. A'Pieu is already recognised as one of the most affordable beauty brands in South Korea. I remember walking into their store at Myeongdong and was completely amazed looking at all the prices they offered. They sold the cheapest sheet masks and also hand creams and I did borong them a lot. In Malaysia, someone mentioned that the price range for A'Pieu products in here is okay and affordable enough within drugstore budget. I know I wanted to get the madecassoside cream because it received raves from skincare bloggers and have a cult following. People had been calling it as a dupe to Dr. Jart+ Cicapair Cream. 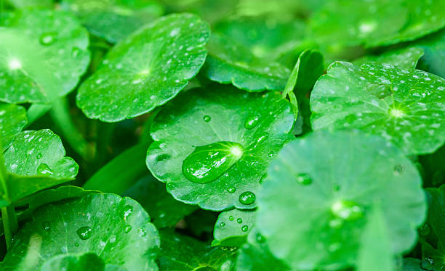 Centella asiatica leaf water (40%), Water, Cyclopentasiloxane, Phenyl Trimethicone, Propanediol, Glycerin, PEG-10 Dimethicone, Cyclohexasiloxane, Niacinamide, Disteardimonium Hectorite, Ethoxydiglycol, Panthenol, Centella asiatica Extract, Madecassoside (0.1%), Camellia sinensis Leaf Extract, Rubus savissimus (Raspberry) Leaf Extract, Dimethicone Crosspolymer, Hamamelis virginiana (Witch Hazel) Leaf Extract, Pinus densiflora (Japanese Red Pine) Leaf Extract, Sodium Chloride, Lactic Acid, Sodium Lactate, Serine, Urea, Sorbitol, Citrus grandis (Grapefruit) Peel Oil, Citrus limon (Lemon) Peel Oil, Lavandula hybrida (Lavender) Oil, Pelargonium graveolens Flower Oil, Citrus nobilis (Mandarin Orange) Peel Oil, Juniperus mexicana (Cedarwood) Oil, Adenosine, Allantoin, Pentylene Glycol, Caprylyl Glycol, Butylene Glycol, Caprylhydroxamic Acid, Disodium EDTA, Chlorphenesin, Phenoxyethanol. To me, A'Pieu Madecassoside cream is a gel-like moisturiser with rich texture that might look lightweight at first but upon using it, you can instantly experience the coating-silicony feeling. 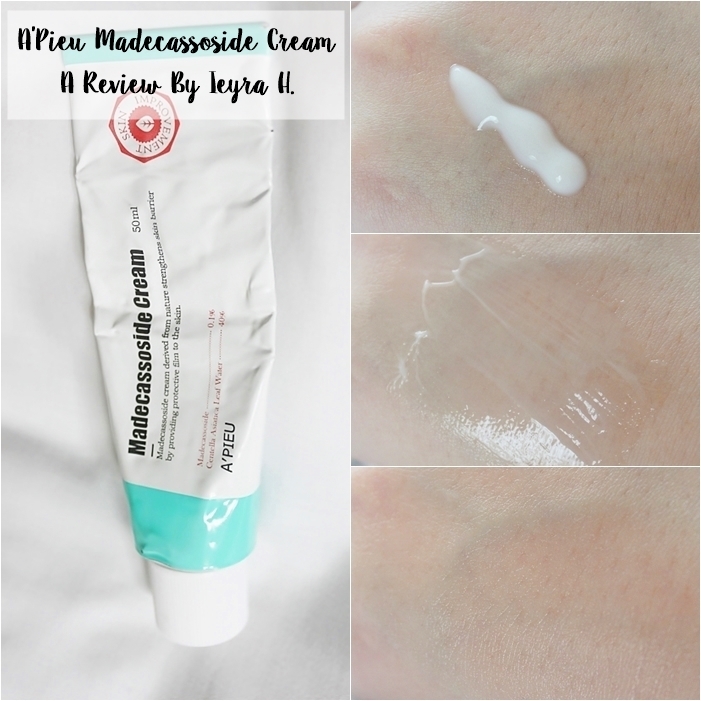 Unlike certain moisturisers that will instantly smooth out the skin, this madecassoside cream, however, will not give you the similar result- it's sticky, might feel heavy to some, but not to the point where I'd consider it uncomfortable. Tiny squeeze from the tube yields too much product because of its runny consistency but it will work in its favour since it gets easily spreadable on both damp and dry skin. Finish is dewy and dissapears a few minutes after it gets fully absorbed into the skin. I don't see 'fragrance' in its ingredients list but there are a lot of plant oils. The scent is definitely sweet with a citrusy undertone and I loved it so much that if they ever decided to bottle this as an EDP, I'd consider buying it. This balm kinda smells like lime, lemon and orange which makes sense because there are a lot of citrusy oils used in the formulation. A quick cosDNA checklist shows that the ingredients are generally okay with none of them are considered an irritant. However, my concern is people have been calling the madecassoside cream as a good moisturiser for sensitive skin but how can you be sure about this although madecassoside itself is indeed a good skincare ingredient. You still need to consider the usage of several plant oils in this product and I'd not suggest it if your skin shows sensitivity towards citrus extractions or any other plants listed in the ingredient list. Always patch test before using. Layered well on its own but can't say the same if you're using this with a foundation afterwards. The result varies according to base makeup that you're using, technique (brush or sponge), waiting time and so on. However (this is somewhat an unpopular opinion), you can use the madecassoside balm as a hydrating primer. Its incredible "coating" capability that works most of the time is the reason why I think it suits the label. Plus, it has dimethicone high up in the ingredient list and FYI, dimethicone is known to be the main ingredient for most face primers. I will put a layer of sunscreen first, followed by this cream (wait for it to dry) and proceed with foundation. A'Pieu Madecassoside Cream does not contain retinol like certain cica-focused moisturisers, hence it's suitable to be used in both AM and PM skincare routine. I mainly use it during AM and (again) yes, as a primer. I love how it moisturises my skin deeply, forming a film/barrier/shield on top of my skin. I could see myself using this to max if I were to live in a cold country. In this Malaysian's weather tho, it's tricky- I will skip this if the night is humid or else my skin will be sweating crazily. I have read reviews that mentioned the effectiveness of this cream as a spot treatment but I have to disagree because it does not work on me, same goes for reducing redness. YMMV, of course!. However, I'm taken by surprise at how soothing this moisturiser is and I particularly enjoy the fact that it's meant to seal and protect the skin barrier. While it doesn't irritate or break out my skin, it doesn't seem to do any huge difference to my skin too, so I guess I'd categorised it as a decent product. I'd gladly repurchase A'Pieu Madecassoside Cream as well as trying different creams with other botanical extracts from the same line. To those who have been wanting to try cica-creams from Dr. Jart+ or La Roche-Rosay but hesitate and feeling afraid that those might not work, this A'Pieu cream might be a great option. It's a moisturiser with a lot of excellent ingredients and the price is within drugstore budget. That's it and thank you so much for reading! Don't forget to follow me on Instagram (@ieyrahm) and Bloglovin! you're welcome dear! I've been really enjoying A'Pieu products lately, they are mostly cheap compared to other k-beauty brands!